The leaflet for the Jun. 22 Master class Updated! The leaflet for the Dec. 8&9 Recital Updated! The leaflet for the Mar. 4 Concerto Updated! 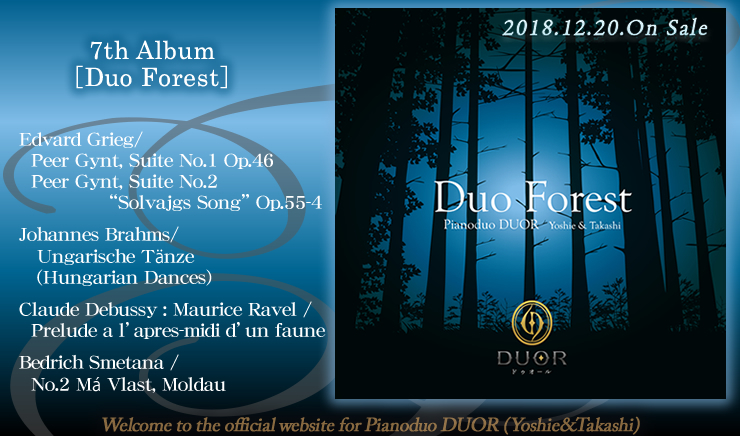 Biography (for Pianoduo DUOR) Updated! The leaflet for the Oct.9 Seminar Updated ! The leaflet for the Jun.23 Master class Updated ! The leaflet for the Mar.2 Lecture Updated ! The leaflet for the Apr.28 Concert Updated ! Biografie (Klavierduo Deu‘or ) Updated! The leaflet for the Oct.23 Seminar Updated ! The leaflet for the Oct.7 Concert and the Nov.30 Concert Updated ! The leaflet for the July 27 Recital Updated ! The leaflet for the Nov. 27 Recital Updated ! The leaflet for the Nov.10&11 Open rehearsal & Concert Updated! The leaflet for the July.10 Concert Updated ! The leaflet for the May 8 Master class Updated ! The leaflet for the May 7 Concert Updated ! The leaflet for the July.16 Recital Updated ! The leaflet for the June.26 Recital Updated ! The leaflet for the Mar. 6 Concert Updated ! The leaflet for the Apr. 10 Lecture and the June 4 Seminar Updated ! The leaflet for the Apr. 23 Seminar&Concert and the Aug. 31 Seminar&Concert Updated ! The leaflet for the Mar.16 Recital Updated ! Concert leaflets in 2016 updated! The leaflet for the Dec. 3 Recital and the Dec. 21 Recital Updated ! Live-Recording from our 10.memorial recital series 2014 Updated! The leaflet for the Oct. 10 Concert and the Oct. 11 Seminar & Concert Updated ! The leaflet for the Aug.21 Guest Performance and the Nov. 8 Recital Updated ! The leaflet for the Aug.17 Concert Updated ! The leaflet for the Sep.15 Concert Updated ! The leaflets for the May.30 Lecture , the June 15 Advice & Concert and the June 28 Recital Updated ! The leaflets for the April.12 Lecture and the June 6 Advice & Concert Updated ! The leaflets for the Mar.21 Concert and the Mar.21&22 Advice lesson Updated ! Concert leaflets in 2014 updated! The leaflet for the Jul.6 Concert Updated ! The leaflet for the May ４ Concert & the May 22 Concert & the Jun. 19 Concert & the Jul. 13 Recital & the Nov. 13 Recital Updated ! Our anniversary year 2014 Schedule Updated! The leaflet for the Oct. 20 Concert & the Nov.3 Concert Updated! The leaflet for the Aug. 31 Recital Updated! The leaflet for the May 13 Concert Updated! The leaflet for the Feb. 3 Advice Lesson & the Apr.26 Concert Updated! The leaflet for the Dec. 18 Concert & the Jan.3 Concert & the Feb.28 Concert & the Mar. 20 Concert Updated! The leaflets for the Nov.3 Advice & Concert and the Nov. 13 Pianoduo Concert Update! The leaflet for the Feb.5 Recital Updated! The leaflets for the Jan.22 Concert and the Feb.26 Recital and the Mar.2 Lecture and the Apr.19 Concert Updated! The leaflets for the Sep.16 Concert and the Oct. 22 Recitals Updated! The leaflets for the Sep.21 Concert and the Nov. 12 Recitals Updated! The leaflet for the April 22 Concert Updated! The leaflet for the May 15 Concert Updated! The leaflet for the Oct. 22 Recital Updated! The leaflet for the Oct. 15 Concert Updated! The leaflet for the Sep. 18 Recital Updated! The leaflet for the Dec. 6 Concert Updated! The leaflets for the Sep.25 and the Oct. 7 Recitals Updated! The leaflet for the Aug. 29 Recital Updated! The leaflet for the Sep. 12 Concert Updated! The leaflet for the July 18 Recital Updated! The leaflet for the Jun. 12 Guest Performance Updated! The leaflet for the Apr.4 Guest Performance Updated! The leaflet for the Feb. 14 Recital Updated! The leaflet for the Sep. 20 Concerto Updated! Photos & Music (our music from YouTube) Updated! The leaflet for the Apr. 13 and the May 8 Concert Updated! The leaflet for the Mar. 20 Gala Concert Updated! The leaflet for the Mar.15 Recital Updated! The leaflet for the Dec.19-21 Recital Updated! The leaflet for the Nov. 28 Recital Updated! The leaflet for the Sep.11 Concert Update! The leaflets for the May 31, June 5&19&20, Aug.5 and Sep.1 Recitals Update! The leaflets for the Apr.14 and the May 12 Recitals Update! The leaflet for the June27 Recital Update! The leaflet for the Feb.9 Recital Update! The leaflet for the Feb.7 Recital Update! The leaflet for the Dec.18 Recital Update! The leaflet for the Mar. 28 Concert Update! The leaflet for the Mar. 28 Recital Update! The leaflet for the Apr. 1 Recital Update! The leaflet for the Nov. 5 Recital Update! July 21 Top Page Renewed! Frohe Weihnachten und einen guten Rutsch Sie allen!! We wish you happy holidays and a happy new year 2017! We wish you a wonderful new year 2015! We wish all of you a happy Christmas time! We wish you Happy New Year 2012 ! We wish you Merry Christmas and the Happiest New Year! We wish you a happy new year 2009! / Wir wunschen Ihnen ein frohes und gesundes neues Jahr 2009! We have our new team name! / Wir haben unseren neuen Duo Namen! We wish you a happy new year 2008! / Wir wunschen Ihnen ein frohes und gesundes neues Jahr 2008! Please enjoy our music! : this is the first time for us to carry it on our website. Das PianoDuo Yoshie&Takashi ist seit August 2007 ein Mitglied in der Million Concert Gesellschaft (Musikagentur) in Japan. We won the Barock Saal prize at Aoyama Music Awards 2006 in Kyoto, Japan! We wish you a happy new year 2007! / Wir wunschen Ihnen ein frohes und gesundes neues Jahr 2007! We won the 2nd prize at the Music Competition for Contemporary Music in Japan! Hier können Sie Fotos sehen! / Here you can see photos! in the Atrium Concert in Tokyo, Japan, on Feb.24. We wish you a happy new year 2006! / Wir wunschen Ihnen ein frohes und gesundes neues Jahr 2006! We won the Best Performance Prize of the Newly Commissioned Work at the 10th.Murray Dranoff International Two Piano Competition in Miami, U.S.A.
(World Premiere "Urban Pulse", composed by Marcel Bergmann on Dec.22 at the Lincoln Theater). Wir haben beim 1.europaischen Kammermusikwettbewerb Karlsruhe in Deutschland gewonnen! / We won the prize at the 1st.Europe Chamber music Competition Karlsruhe in Germany! We won the 2nd prize (the top prize) at the London International Music Competition in United Kingdom! 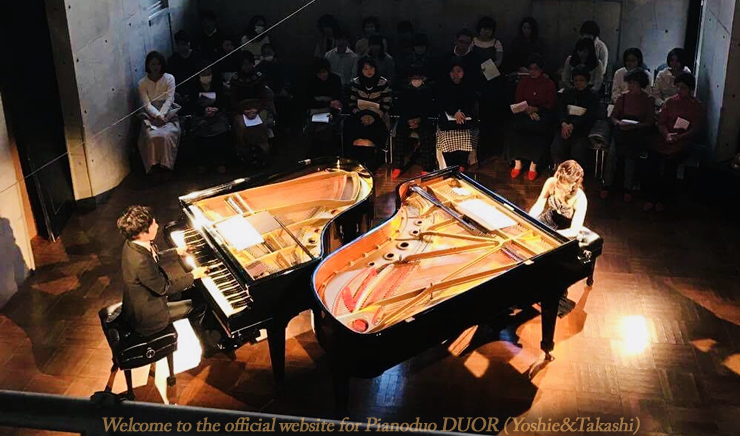 We have been selected as finalists for the 10th Murray Dranoff International Two Piano Competition (the member of World Federation of International Music Competitions). The final is to be held in this December in Miami. Here you can see photos in the International Schubert Competition for piano duets in Czech Republic.